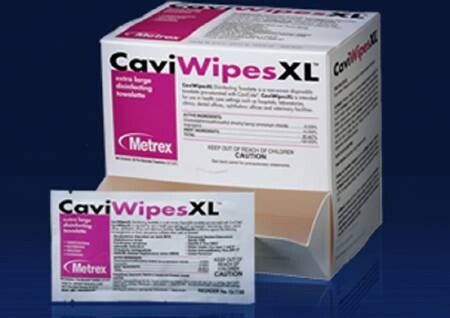 Metrex Research CaviWipes are presaturated with CaviCide®. 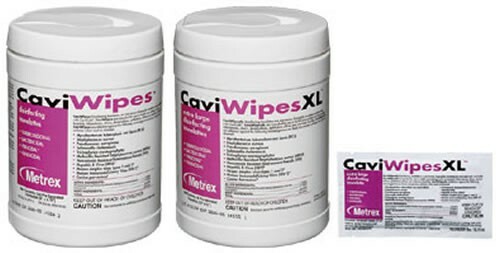 CaviWipes are proven to kill both TB (in 5 minutes) and HBV (in 3 minutes) with quick, easy-to-use, timesaving convenience. 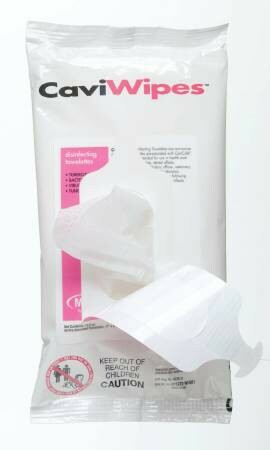 CaviWipes are durable, non-woven, nonabrasive towels that won't bunch up during use. 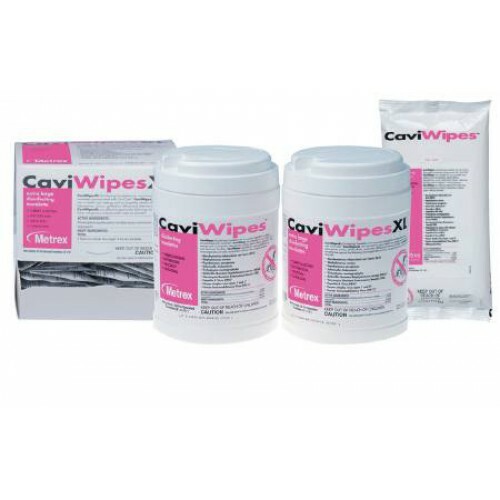 They offer better surface contact than other wipes, requiring less force to apply solution to a surface. Better fluid capacity keeps the cloths fully saturated with CaviCide rather than its pooling at the bottom of the canister. 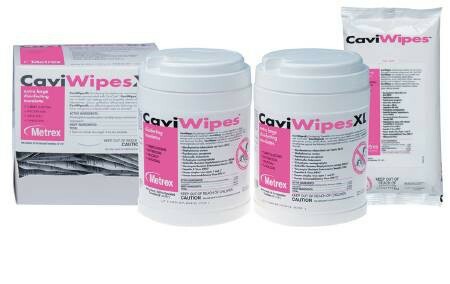 CaviWipes is a cleaner and disinfectant, in one. Saving money by reducing repetitive inventory and time. They're recommended for use on nonporous surfaces and fixtures and are perfect for operating rooms, surgical centers, neonatal units, medical and dental operatories and other critical-care areas. Size of wipe in container: 6" x 6.75"
Size of wipe in wrapper: 7" x 9"
Can we use these wipes on leather chairs without damaging the leather? According to the manufacturer; no. Their FAQ statement is as follows: CaviCide is indicated for use on non-porous surfaces. Porous surfaces can provide microorganisms with a place to hide and if we can't be sure we are contacting them, we can't be certain we're killing them. I utilize this product at work and just had to have them at home. There is not an easier or safer way to clean. The convenience of the product is just an added bonus. I also use them at the camper...so many easy, endless ways to use them! These wipes are very useful and durable. Very effective and even do not get dry. I do not get any tears while using these wipes.